This entry was posted on January 11, 2009 by Megan @ When Harry Met Salad. It was filed under reflections and was tagged with failures, granola. What kind of camera do you use? Your pics (even ones of burnt granola….) are gorgeous! The birds are sooooo pissed! Hey, I just got a stand mixer with a dough hook so now I’m going to try your white pizza. I bought high altitude flour though so the first couple dough batches might go in the trash as I’m pretty sure they’ll be bad, even for the birds. I’ve been catching up here and it is dangerous. I’ve been on a limited diet for awhile now and your food looks soooooo yummy! 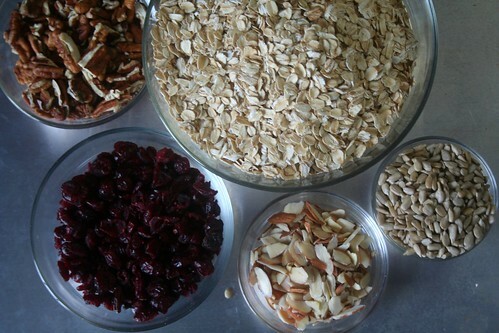 I have a granola recipe that my mom used to make for my dad. As I recall it was very yummy. I’ll have to look for it – maybe it has an idea or two you can draw from. And yes, I recall from a cheeseball coating recipe I have that cooking time for oats was a real issue. Oats are tricky buggers that way!! My chickens are jealous of your birds! 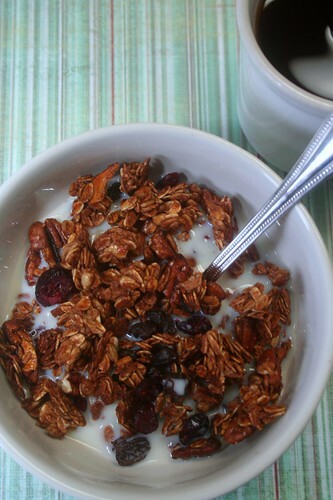 Your burnt granola sure is photogenic! Your birds must be very happy. “I’m really not very good at not being good at things…” I resemble this remark. Currently trying to learn to knit, and spending a lot of time pissed and frustrated because I don’t have an inborn instinctive talent for it. On the plus side, I’ve been baking some awesome bread lately. Bleh. Can’t see the pic at work…but I can sure relate. I had a bad experience with pasta making the other night. Started from scratch with semolina, cracked that stuff out by hand, you know. that is the tastiest looking granola i’ve ever seen. one might do nicely to help fill in those breaks. If you actually can accomplish that, I will surely be fascinated.